Sheikh Mohammed called for a "knowledge-based society"
The ruler of Dubai, Sheikh Mohammed bin Rashid al-Maktoum, says he is giving $10bn (£5bn) to set up an educational foundation in the Middle East. The money is meant to improve the standard of education and research in the region, and aims to stimulate job creation, Sheikh Mohammed said. It is thought to be one of the largest charitable donations in history. The announcement was made to widespread applause at the World Economic Forum, which is being held in Jordan. Sheikh Mohammed, known as a successful racehorse owner as well as ruler of Dubai, said his personal initiative was aimed at creating what he called "a knowledge-based society" in the Middle East. At the moment, he explained, there was high illiteracy in the region - where more than 40% of Arab women cannot read or write. The whole Arab world publishes fewer books than the country of Turkey. And spending on scientific research is only a tiny fraction of that in developed countries. "There is a wide knowledge gap between us and the developed world in the West and in Asia. Our only choice is to bridge this gap as quickly as possible, because our age is defined by knowledge," the sheikh said. While there may be less learning in the region, there is high unemployment, and it is likely to get higher with a rapidly growing population. "Our region needs at this moment 15 million job opportunities, and our Arab world will need in the next 20 years between 74 to 85 million job opportunities," the sheikh told the conference. "We need to develop the infrastructure so we can create jobs." Sheikh Mohammed hopes to increase education and research, and also to encourage innovation and entrepreneurship throughout the region. "In order to realise these objectives, I have decided to establish the Mohammed bin Rashid al-Maktoum Foundation to focus on human development, and have I decided to endow a fund of $10bn to finance its projects," he said. 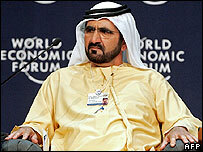 As ruler of Dubai, he can share the success of his principality, which is known the world over as the economic success story of the Middle East.